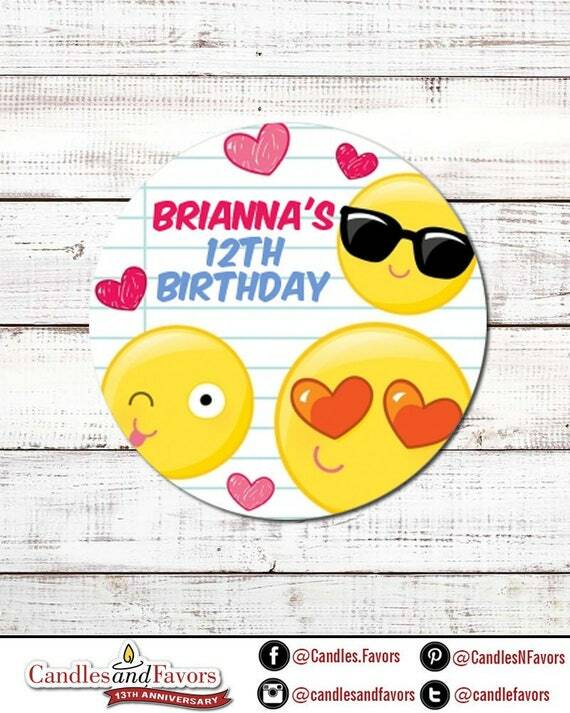 Our personalized Emoji Birthday Party round sticker labels are the perfect way to add a little style to a "do it yourself" birthday party project, store-bought favors or even a birthday party gift. Pricing for stickers is per set. We offer 10 different size stickers on the pull-down menu in each shop listing. * .75 inch circle - 108 stickers per set. * 1.0 inch circle - 63 stickers per set. * 1.2 inch circle - 48 stickers per set. * 1.5 inch circle - 30 stickers per set. * 1.67 inch circle - 24 stickers per set. * 2.0 inch circle - 12 stickers per set. * 2.25 inch circle - 12 stickers per set. * 2.50 inch circle - 9 stickers per set. * 3.0 inch circle - 6 stickers per set. * 3.3 inch circle - 6 stickers per set. 1. Stickers are printed on high-quality matte labels with adhesive backing. All you have to do is peel and stick! 3. Personalized with up to three (3) lines of text. The shipping charges in the listings are for First Class USPS with tracking and delivery confirmation. Delivery ranges from 2-7 days. If you need to "shave off a few days" please send me a message and I can upgrade your order to priority mail for a nominal fee. Express shipping is available as well. This item is for personal use only. Candles and Favors retain all rights. This item may not be copied, shared, forwarded, sold or distributed. Copyright Candles and Favors, Inc.